Few breeds of dog are as intimidating as the Doberman. Powerful, strong, and imposing, this breed was designed to be scary enough to ward off danger, which is why the Doberman breed was adopted by the United States Marine Corps as their canine companion of choice. 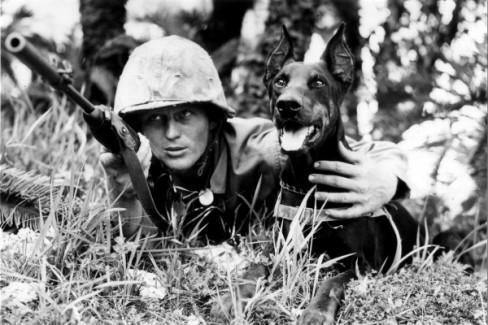 The USMC’s Devil Dogs, as they became known, served alongside the Marines…and the heroism of one of the Devil Dogs, Cappy, saved the lives of hundreds of men during the Battle for Guam. Even before the U.S.’s involvement in World War II, the United States Marine Corp recognized the value of Dobermans as war dogs. During the Banana Wars in Central America during the first few decades of the 1900s, the Marines encountered guard dogs situated around the perimeter of guerrilla encampments that thwarted their efforts at surprising the enemy. For their own team of sentry dogs, the Marines looked to the Doberman, a dog breed that was specially created to be a guard dog. Dobermans were developed in late-19th century Germany by Karl Friedrich Louis Dobermann. Dobermann worked as a tax collector but he had a few side gigs as well. One was as a night watchman and the other was as the overseer of the town’s dog pound. Collecting tax money throughout the countryside put him at risk for bandits, as did his job as a night watchman. Dobermann used his position at the dog pound to start his own breeding program with the goal of developing an intimidating and vicious guard dog who was also intelligent, athletic, and a faithful companion. The result was the dog that now bears his name, the Doberman. Somewhere along the line, one of the Ns was dropped, but it serves as a good way to separate the man from the beast. 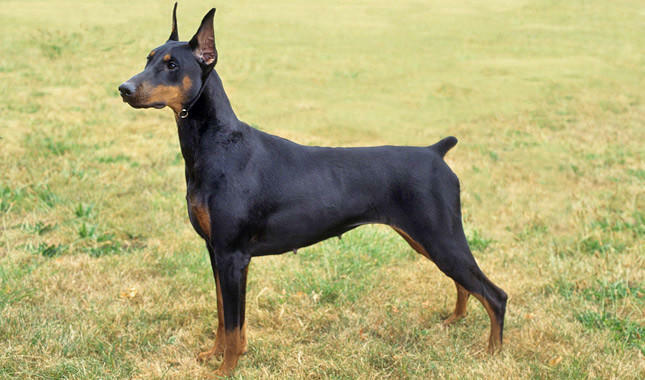 Unfortunately, Dobermann was a better dog breeder than he was record-keeper so we do not know exactly which breeds of dog he used in the development of the Doberman, but there was most likely some Rottweiler and German Pinscher involved. As he intended, Dobermann developed a dog that is large and ferocious in appearance, but it gentle and loyal to its owner. Dobermans are strong, smart, hard-working dogs with an incredible amount of endurance, making them ideal for the rigors of military work. 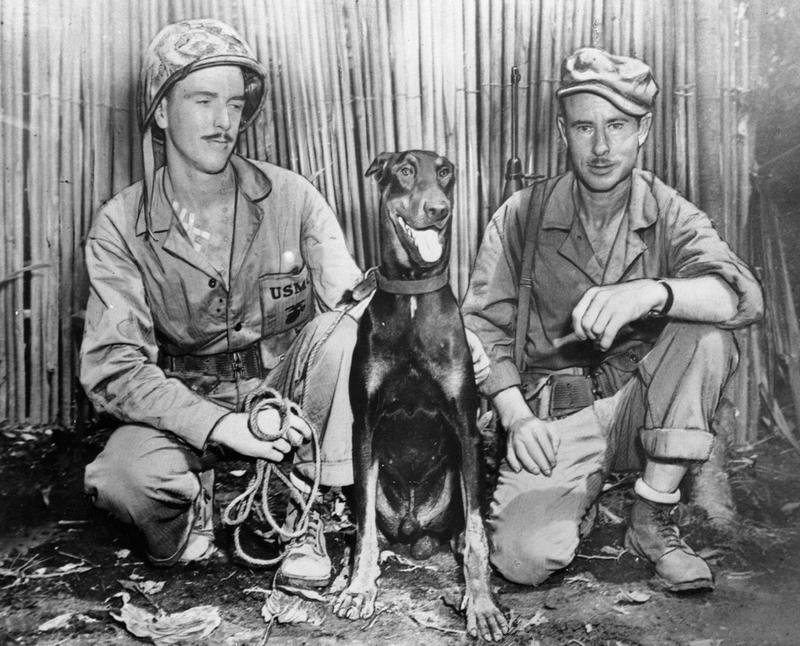 Doberman Devil Dogs joined the U.S. Marines when they landed in Guam in July of 1944 to reclaim the island, a United States territory that had been captured by the Japanese a few years earlier. 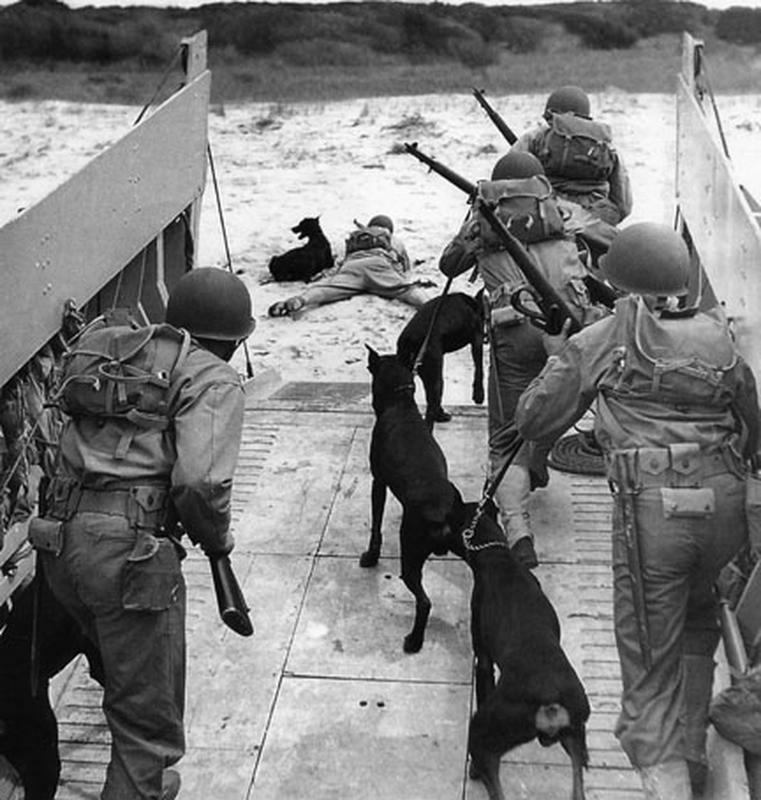 The Second and Third War Dog Platoons, also known as the Devil Dogs, worked alongside the nearly 500 patrols on the island. 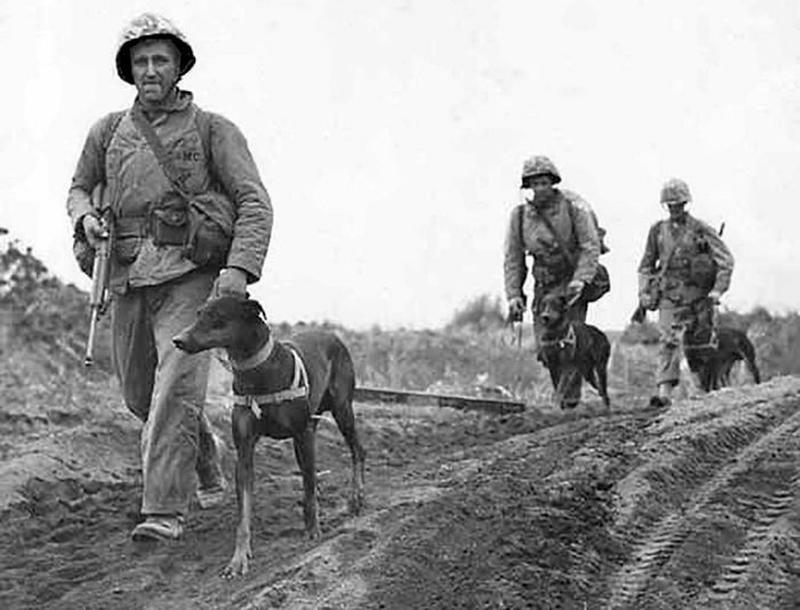 The war dogs stood guard over camps, delivered messages, alerted the Marines to landmines and booby traps that the Japanese had set, rescued wounded Marines, and searched through caves looking for Japanese soldiers and military supplies. Their work was vital to the war effort. One night, a Doberman sentry named Cappy was standing guard over 250 sleeping Marines when he detected the presence of the Japanese. In fact, an enormous force of Japanese troops was advancing on the unsuspecting camp when Cappy alerted his men. The heroic action of Cappy saved the lives of 250 men, but Cappy was injured in the ensuing battle, as was his handler, PFC Allen Jacobson. Jacobson himself refused to leave the battle or be treated for his injuries until Cappy had been evacuated. Sadly, Cappy later succumbed to his injuries, making him the first Devil Dog to be killed in battle during the fighting in Guam. He wasn’t the last. Sixty war dogs were deployed to Guam and twenty-five of them died in action. Twenty more suffered injuries. Cappy is buried on Guam, along with the Devil Dogs that died with him. Today, the Naval Base in Guam is home to the National War Dog Cemetery and Memorial, thanks to the efforts of William Putney, the commanding officer of the 3rd War Dog Platoon, who was dismayed that the burial plots of the Devil Dogs were all but abandoned. 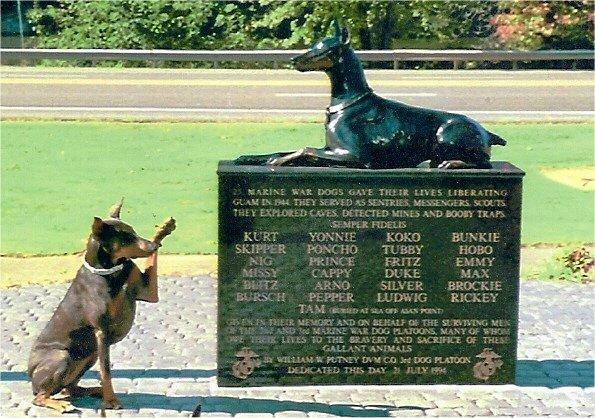 In the 1980s, Putney began lobbying for the establishment of a war dog memorial and initiated fundraising efforts for the creation of the National War Dog Cemetery. The buried remains of Cappy and the other fallen war dogs were relocated to a site on Guam’s naval base. On the 50th anniversary of the Second Battle of Guam – July 21, 1994, the National War Dog Cemetery and Memorial were officially dedicated. A bronze statue of the ever-vigil Cappy, created by artist Susan Bahary of California, sits on top of the memorial. Bahary named her statue “Always Faithful”, a translation of the United States Marine Corps’ motto “Semper Fi.” It is a fitting tribute to Cappy and his fellow Devil Dogs of the Marines for their faithful and loyal service to their country, and a special nod to Karl Dobermann, whose efforts to breed a formidable guard dog led to the development of the Doberman breed. God bless these good dogs and their men. Ave atque vale.